Bollard covers or also known as totems are digitally printed direct to Correx® board, which due the fluted nature of the material is easy to score and fold to form a sturdy bollard wrap. Ideal for indoor and outdoor usage, for vibrant point of sale and event advertising that is easy to set up and cost effective. Available as 3 sided triangular wraps, or 4 sided squared, and printable up to 3 meters in height and other custom sizes on request. What's the largest bollard cover you can produce? The largest we can produce on a single sheet would be 3000m in height, with sides at either 500mm (3 sides) or 375mm (4 sides). Other larger sizes are available but would need to be split across multiple sheets. What thickness Correx® do you supply? What is the maximum size that you can print in one piece? The maximum sizes that we can print in one piece are 8 x 4ft sheets and 10 x 5ft sheets, dependent on the thickness you choose, either or both sizes may be available. What are Correx® boards made of? Correx® boards are made of strong corrugated plastic material, which is also known as polypropylene fluted board. Can Correx® signage boards be cut to custom shapes? Yes, 4mm and 6mm Correx® signage boards can be cut to custom shapes. There is some limit to how intricate the shapes can be - so you would be best to send over an example of the shape you wish to cut when asking for a quote. Correx above 6mm is generally not suitable to custom shape cutting, we have other materials that may be suitable to your needs if you’re looking for a thicker board, like foamcore and Foamex. Does Correx® signage suit dual-purpose (outdoor and indoor) needs? Yes, you can make use of Correx® signage for both indoor and outdoor use. Correx® is actually a brand name for a specific type of corrugated plastic, also known as polypropylene fluted board. The material is most widely used for estate agent signs and quick, durable outdoor signage like scaffolding signage or race signage. Are Correx® boards suitable for outdoor and indoor use? Yes. It's usually used for outdoor use but can also be used inside. Is it more expensive to print multiple colours? No, we digitally print all of our products in full colour using UV resistant inks as standard. So you won't see any increases in price if you have a lot of colour in your artwork. How do I submit my artwork files? Simply attach your artwork via our upload option when placing your order, our uploader will accept Jpeg, Tiff, PNG, PDF and ZIP files up to 50mb. It is recommended to ensure artwork files are optimised to retain a reasonable file size. You can also simply use our email address (at the top of the website) and attach your files. If you have any problems with sending large files give us a call or use file sharing services like WeTransfer.com. If you are using WeTransfer or similar, we highly recommend sending an email alongside this, as we do not pick up orders from WeTransfer emails. What are requirements for artwork files? Please include cut path for cut out boards indicating expected board shape OR simply describe where it should be, and we will draw the shape for you in most cases free of charge. In case you require and design work or are uncertain about the files you have please just attach your files with description in your message. We will help and advice. If there would be any extra charge involved, we will let you know before proceeding with any changes. Am I able to collect from you directly rather than arrange delivery? We are located in a town called Whitefield just outside of Manchester City Center, if you happen to be local, or are just passing by, you're more than welcome to collect your order from us directly. If this would be preferred just let us know when sending over your order. When you get an email saying there’s some roller banners to produce for an event happening all over the UK working in partnership with one of the biggest rock bands in the world, it obviously gets attention and builds intrigue here at Carrick Signs. We’ve worked with Rocksteady Music for a number of years now and have always managed to successfully deliver, high quality print for their rapidly growing music school business. Lightweight, rigid and affordable corrugated plastic board, ideal printable material for quick outdoor signs. Fluted polypropylene board, best known under the brand name Correx®, is probably the most popular and the cheapest printable board you can get. Most people know Correx material as it is used also for the estate agent boards. Corrugated boards are lightweight, rigid, water-proof, easy to cut or attach, and inexpensive at the same time. 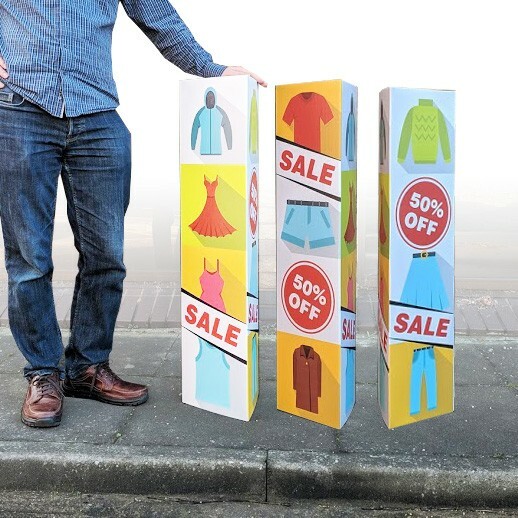 This is probably why Correx® boards represent the best value for money signage material, ideal for temporary signs or quick street advertising campaigns. Rigid Foam PVC, or Foamex is the board of choice for those looking for something a little more hard-wearing and of a smoother finish than the Correx® board. With a smooth bright white finish, once printed on our UV cured printers your signs will look the part, eye-catching, bright and clean advertising. It’s suitable for indoor and outdoor advertising as it’s fully water-proof and compared to traditional wooden signage, is still extremely light. Widely used for everything from Shop front signage, to directional signs in hospitals, to selfie prop's and more. Picketing placard printing. Protest placards and advertising street signs with wooden sticks. Order high quality, light weight placards in any size or quanity. PVC outdoor banners printed to any size. Strong 450gsm 'stop tear' banner material for extra durability. Premium modular pavement display system with high quality printed banners. Cafe barriers are ideal for restaurants and cafes with outdoor drinking and eating area. Available in a range of sizes and polished stainless steel finish. Aluminium Composite Board, aluminium panel with polyethylene core. Ideal for indoor and outdoor use, durable high resistant rigid media. Toblerone Signs, bespoke Correx® signage toblerones available triangular or two sided with a PVC strip attached to the reverse. Vibrant point of sale and event advertising, cost effective, easy to set up and ideal in indoor and outdoor use. To let and for sale estate agent boards. Standard board size 610 x 813mm available as 'T board' style printed on two seperate sheets of 4mm correx and mounted together. Also available as a 'flag' style board, printed double sided on a single sheet of 6mm correx. A-Boards and A-Frames, the ideal choice for street side point of sale and advertising for businesses. Designed for durable outdoor use, providing an affordable and professional looking pavement display, easy to set up, and folds for effective storage. Bubble Board, is an eco-friendly polypropylene sheet ideal for the print and signage. The cell structure of the bubble allows the sheet to be manufactured at a lower weight than other polypropylene sheets but still retain strength and rigidity as well a high quality print finish. Swing Signs, the ideal choice for street side point of sale and advertising for businesses. Designed for durable outdoor use, providing an affordable and professional looking pavement display. Sightmaster Pavement Sign, the ideal choice for street side point of sale and advertising for businesses. Designed for durable outdoor use, providing an affordable and professional looking pavement display. Available as standard in teardrop or feather shape, get your custom printed flag for your events here. The ‘eco-nomical’ and 'eco-friendly’ visually effective sign, reliable high performance outdoor streetside signage. Copyright © Carrick Signs Limited. All Rights Reserved. There was an issue with setting your preferences. If this keeps happening, please email info@carricksigns.co.uk so we can fix the issue.